APM Terminals are investing in additional track capacity. This autumn a sixth rail line will be completed, and the rail length will be extended to accommodate trains up to 750 metres long. 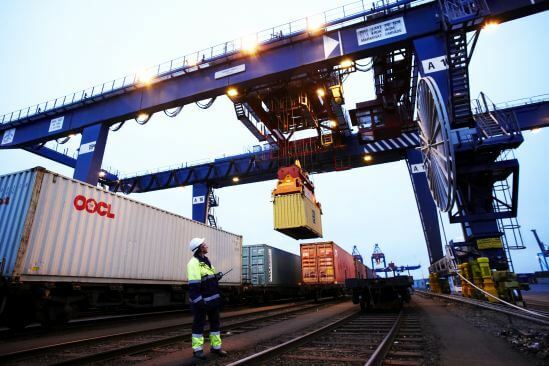 With effect from this autumn, APM Terminals, which operates the container terminal in the port of Gothenburg, will be able to take three full-length trains, compared to two at present. “We are increasing our capacity at the railhead with 50 percent. At the same time our train operators benefit from an increased rail capacity of 15 percent as we go from 640 to 750 meters of track length. This is a welcome investment for Swedish trade and industry when we speeds up handling for our rail operators and provides a competitive advantage through increased freight capacity,” says Keld Pedersen, CEO of APM Terminals. In addition to the rail extensions this latest investment also includes two new rail cranes, which will increase operational reliability and provide a better working environment. Around half of all containers are currently transported to and from the container terminal by rail, which provides major environmental benefits. Freight is distributed by 25 rail shuttles to the Swedish and Norwegian markets, giving industry access to the terminal’s wide choice of shipping services to key import and export markets. The rail investment is part of a total investment package by APM Terminals worth just over SEK 800 million by the year 2016, which is intended to increase the capacity, efficiency, productivity and competitiveness of the terminal.